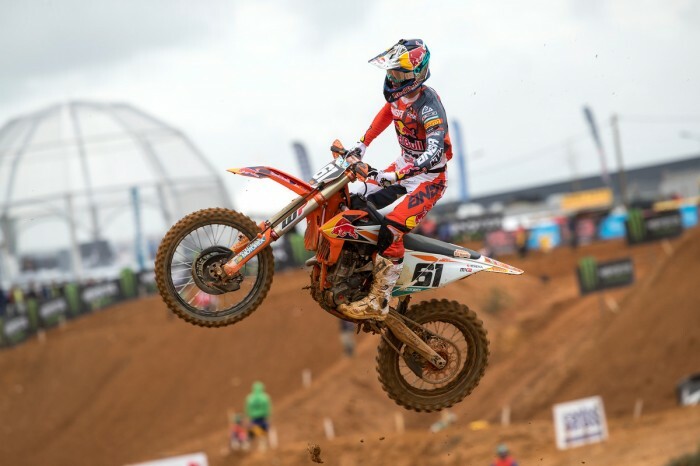 While his team-mate Jeffrey Herlings was dominating the MXGP motos, Red Bull KTM’s Jorge Prado produced a whitewash of his own in MX2. “Second win in a row,” said the 17-year-old Spaniard. “Last year I won three GPs but never two in row so I am getting there, I am getting to where I want to be. We are training hard and it pays off. After stuttering last time out in Italy, Denmark’s Thomas Kjer Olsen was happy to put the Rockstar Energy Husqvarna back on the box in second. F&H Kawasaki rider Jed Beaton set up his third place on the podium with a solid performance in the previous day’s qualification race. Following two consecutive below-par performances, defending champion Pauls Jonass has been put on the back foot by his team-mate Prado. “It is still nice to have the red plate and the championship lead but I’m really disappointed with how the weekend went,” said the Latvian. “I just couldn’t find the rhythm or find a flow and I was struggling a lot with the track and myself.